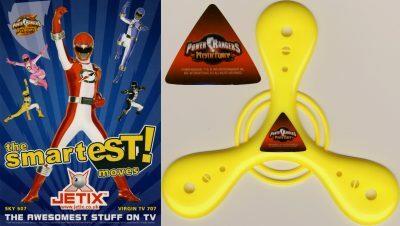 Power Rangers free gift photos. 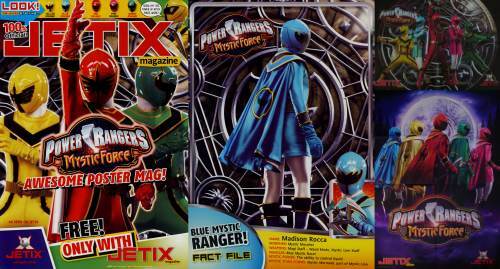 Issue 32: Mystic Force poster magazine featuring three fact file posters of the red, green and blue rangers. A bigger group poster and a huge vertical poster of the rangers showing their capes. Issue 37: A second Mystic Force poster magazine featuring three interview posters with the red, yellow and blue rangers. A bigger group poster and a huge vertical poster of the rangers ready for action. and a huge poster of the five main rangers with their weapons. Issue 23: Double sided Space Patrol Delta poster with the toys featured on one side. 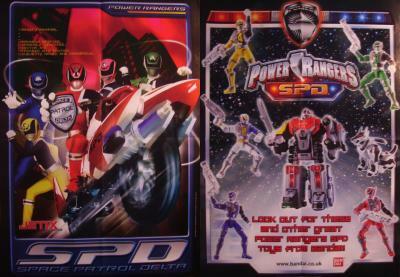 Operation Overdrive postcard from issue 43 and a Mystic Force boomerang from issue 41. Issues 29, 33 and 50: Small Mystic Force stickers from Jetix sticker sheets.